Castlemaine is a small city in Victoria, Australia, in the goldfields region of Victoria about 120 kilometres northwest by road from Melbourne and about 40 kilometres from the major provincial centre of Bendigo. Change things up with these side-trips from Castlemaine: Woodend (Holgate Brewhouse & Hanging Rock Reserve), Daylesford (The Mill Markets, Lake Daylesford, & more) and Mount Macedon (in Macedon). The adventure continues: don't miss a visit to Vietnam Veterans Commemorative Walk, admire the natural beauty at Castlemaine Botanical Gardens, get to know the fascinating history of Main Street, and learn about winemaking at Tahbilk Winery, Cafe & Wetlands. To see other places to visit, traveler tips, maps, and tourist information, refer to the Castlemaine day trip planning tool . Melbourne to Castlemaine is an approximately 2-hour car ride. In April in Castlemaine, expect temperatures between 23°C during the day and 11°C at night. Finish your sightseeing early on the 6th (Mon) so you can travel to Byron Bay. Explore Byron Bay's surroundings by going to Tweed Regional Gallery & Margaret Olley Art Centre (in Murwillumbah), Watersports Guru (in Kingscliff) and Tropical Fruit World (in Duranbah). On the 14th (Tue), give your taste buds a day to remember with a local gastronomic tour. Spend the 17th (Fri) exploring nature at Bundjalung National Park. 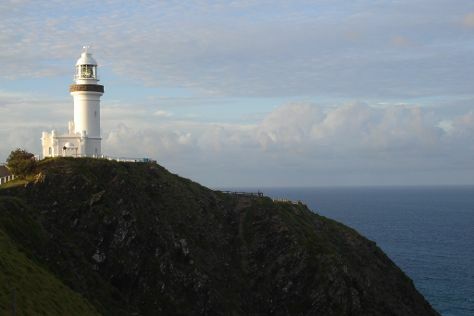 There's much more to do: trek along Cape Byron Walking Track, enjoy the sea views from Cape Byron Lighthouse, let the kids burn off some steam at Crystal Castle & Shambhala Gardens, and admire all the interesting features of The Farm Byron Bay. To see maps, ratings, more things to do, and more tourist information, go to the Byron Bay online holiday planner . Explore your travel options from Castlemaine to Byron Bay with the Route module. When traveling from Castlemaine in May, plan for a bit warmer days and about the same nights in Byron Bay: temperatures range from 27°C by day to 12°C at night. Finish your sightseeing early on the 21st (Tue) so you can travel back home.